Over the summer, the adoption clinic that we took Miles to when he got home, hosted an essay contest for adopted children and siblings of adopted children. I loved that they recognized siblings as part of their contest because adoption affects every member of the family. Sadie decided to give it a go and today I wanted to share her thoughts. PROMPT: The term "family" is often described differently. What does family mean to you? My name is Sadie and I’m 8 years old. 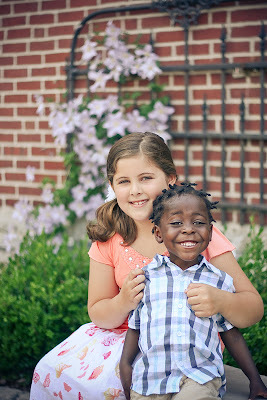 My little brother, Miles, was adopted from Congo. At first it was a little different, but when we got used to it we started to have lots of fun. It was different because he would hide food in his shirt because he never had enough food in Congo. What family means to me is that when you think you don’t like someone (they have different color skin) you really do. We are the same. We still love them no matter what. And now that I think about it we go to church together and play together. That’s what family means to me.